Anaheim, CA– On February 6th-8th, MD&M West will conduct its annual conference and expo that will be held at the Anaheim Convention Center. MD&M West connects you with thousands of advanced design and manufacturing professionals for three days of industry immersion. Source from the world’s largest collection of Medtech suppliers. Connect with over 20,000 engineers and executives who are ready to forge business partnerships. Learn from industry luminaries presenting their insights. EXPLORE NORTH AMERICA’S LARGEST ANNUAL MEDTECH EVENT! Test drive new technologies, find suppliers for all your sourcing needs, and get inspired by the latest innovations with the nation’s largest industry showcase. The expo floor also offers free educational sessions, demos, and guided tours. Plus, new features this year include exhibitor-attendee matchmaking to make sourcing more efficient, and fun prize giveaways. Advanced design and manufacturing’s leading trade shows come together on one floor for the nation’s most comprehensive industry event. Your pass gives you access to a full spectrum of solutions spanning Medtech, automation technology, plastics, packaging, and design engineering. Join over 20,000 industry professionals and more than 2,000 top suppliers as you explore groundbreaking technologies and gain new insights. Who Will Be At MD&M West? This year, one of the solution providers in the expo is the multi-discipline and full-service company RothGreaves & Associates. The company focuses on manufacturing high technology medical devices aiming to produce the world’s most reliable PTFE release finishes. The company also aims to create the world’s greatest coil winders and first-class coatings. 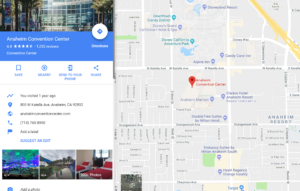 The conference will be held at the Anaheim Convention Center which is one of the largest conference centers in the area. Located on next to Disney Land. Make sure to arrive a few minute early to allow for walking time since the convention center is a very large building and parking is.